Green. It’s the color of money and of hundreds of plants in nature. One cash crop in particular – cannabis – is the focus of an emerging industry that has opened up the opportunities for women to lead. 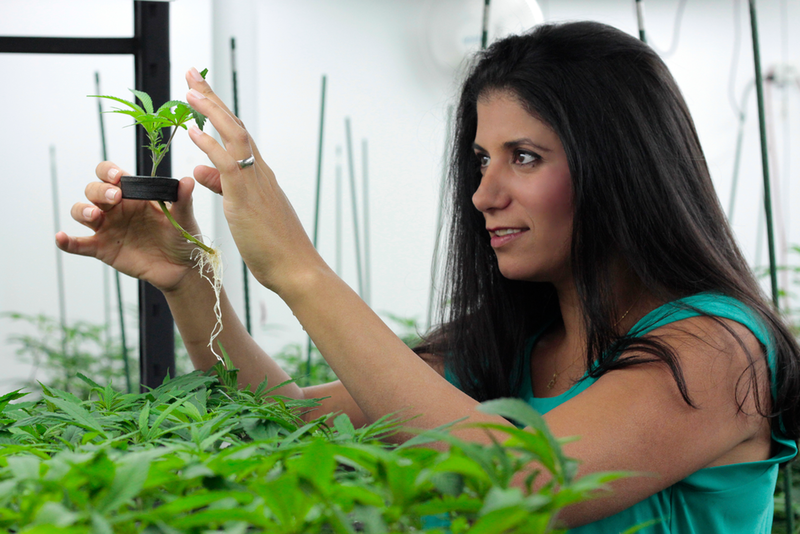 Lilach Power and her business partner did not plan to open a medical marijuana dispensary. The original business plan linked alternative care and western medicine together, but Power says it was just a dream until the Arizona Medical Marijuana Act passed in 2010. At that point, the pair realized the dream could be a reality. In 2013, Power and Berman opened The Giving Tree Wellness Center and collectively contributed $700,000 to open two locations in Phoenix and Mesa. After just four years, the pair employ 57 people and are looking to expand in the future. “The Giving Tree is built on two families,” said Power, co-founder and managing director of the center. Both Power and Berman juggle motherhood while successfully running two marijuana dispensaries; a combination that Power says was more of a risk in 2010. In 2010, Arizona voters passed the Medical Marijuana Act making Arizona the 14th state to adopt a medical marijuana law, regulated by the Arizona Department of Health Services. Now, the state is home to just under 100,000 licensed qualifying patients, over 5,000 caregivers and dispensary agents and about 100 licensed dispensaries, according to the Arizona Department of Health Services. Power says she has been met with challenges that any new business operating in an equally new industry would face, such as with banking and financing, particularly because of the unwarranted stigma associated with cannabis. Those people generated an estimated $30 million in tax revenue for the state in 2016 and $280 million in overall sales, as reported by AZmarijuana.com. After seven years, Power added, the general public has become more accepting of the cannabis industry. As a result, there is a well of untapped opportunities in various ancillary companies. Laura Bianchi, a lawyer and co-director of the Medical Marijuana Cannabis practice group at Rose Law Group, was attracted to the industry for the opportunity to help shape the industry’s laws and regulations. Bianchi decided to lead in her own realm and advises individuals about the ever-changing legal side of the industry. Although cannabis is not federally legal, public opinion on the plant is generally accepting with medical use legal in 29 states and adult use legal in four states. Dealing with these precarious laws from state to state, Bianchi took time to learn about the aspects of the industry she was not familiar with, primarily within organizations that provide networking opportunities. Women Grow, a national organization empowering women to be leaders in cannabis, has a chapter in Phoenix where Bianchi served as co-chair for two years, stepping down in February of this year. She said that Women Grow and other organizations like it, provide a place for individuals to learn about the industry and find the area where their services can be used best. Bianchi’s former co-chair, Sara Gullickson, found her way in as an industry consultant, or as she describes herself, “a gatekeeper” for the industry. Gullickson opened DispensaryPermits.com in 2010 and advises individuals on business plans for cultivation centers and dispensaries, general cannabis education, and obtaining permits and other legal documents. She mentioned that the cannabis industry has specific opportunities in marketing, public relations, real estate, construction and a myriad of others but stressed the importance of an entrepreneurial spirit to be in this industry.